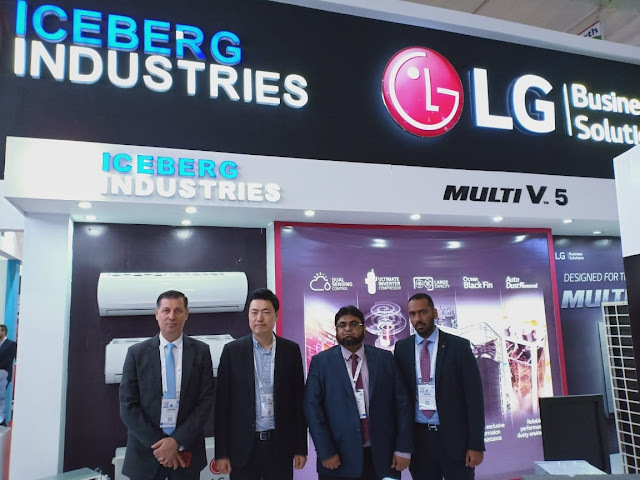 Karachi, February 13, 2019: LG Electronics (LG) along with its local partner Iceberg Industries showcased its revolutionary Air Solution products at HVACR Expo & Conference in Karachi – Pakistan’s largest HVAC (Heating Ventilation Air Conditioning and Refrigeration) industry exhibition. Held from 13-15 February at Karachi’s Expo Center, the yearly expo aims to improve market access through advising the government on matters of trade diplomacy and promoting Pakistan’s business image in key export markets around the world. Prestigious brands from a number of nations were on hand to display the potential of their products across industrial and B2B sectors. The Expo was arranged by Pakistan HVACR Society, an affiliated society of ASHRAE (American Society of Heating, Refrigerating and Air-conditioning Engineers). In terms of participation, over 200 companies from countries including Pakistan, Germany, Turkey, China, Malaysia, UAE and Korea showcased more than 1000 of their products and services. With the latest technology on offer, local and international business communities, corporate executives and government officials attended the event and made it a resounding success. PHVACR Society was established in 1993 for the promotion of art & science of HVACR in Pakistan. The Society is a sole representative body on HVACR and was established to promote the cause of HVACR profession and industry in Pakistan. Right from its inception, Society is making all out efforts for Knowledge Dissemination and Experience Sharing.